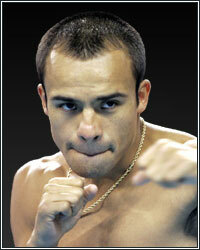 FROM PILLAR TO POST: JUAN MANUEL MARQUEZ LOOKING FOR A WAY OUT? It's funny how one day, a fight is talked about and practically done, and then the next day, it's a whole new fight altogether! That certainly is the case for the supposed April 9th clash between the badly faded Erik Morales and Juan Manuel Marquez, or should I now say Marcos Maidana, who's been tabbed to replace the lightweight champion. Marquez isn't too happy with Golden Boy Promotions and their inability to get him a fight with Manny Pacquiao, and evidently, he isn't too content with the idea of fighting Morales, especially when a long-term contract extension is listed above the dotted line. Maidana-Morales is now looking more and more like it's going to happen. If Marquez stays with Golden Boy, it seems like the only other fight they're trying to make with him is a fight with Robert Guerrero, so instead, Marquez may be opting for free agency, like Shane Mosley did when Golden Boy was hoping that he, for whatever reason, would fight Rigoberto Alvarez and Saul Alvarez back to back. Marquez's departure would leave Golden Boy Promotions at critical mass, having only one rising star on their roster in Amir Khan. Marquez doesn't deserve to fight for peanuts anymore and Golden Boy may lose another fighter because they can't seem to realize that. It looks like the idiots at the WBC have come to a compromise between themselves and Chad Dawson. Dawson will face off against an opponent to be named on the undercard of the Bernard Hopkins-Jean Pascal rematch this May and will receive a "guaranteed" shot at the winner. Of course, the only chance Dawson will make good on that is if Pascal wins. If Hopkins really wanted to fight Dawson, he would've fought him three years ago. Dawson will more than likely face off against Librado Andrade because he is popular amongst Canadian fans and the the site of the card will be in Montreal once again. Let's hope that once Hopkins finishes the job and stops Pascal this time, Dawson will get his fair shake and finally get the fight with Hopkins that a lot of people have been waiting for. Now that Amir Khan has finally found his opponent in Paul McCloskey, HBO has their main event for April 16th, but are still waiting on the co-feature to get signed between WBC champion Andre Berto and Victor Ortiz. The hold up is coming from Ortiz's end; money and weight seem to be the issues that are preventing the fight from being finalized with Ortiz, who wants the fight at 144 despite the fact that he is, you know, not the champion. Berto seems ready to go for the fight, but here we are in February and no deal has come through. HBO isn't going to be too happy if Berto ends up facing a short-notice opponent. They may even ax his slot altogether. After all, the only reason Khan got McCloskey was because HBO said no to Junior Witter as a possible opponent. Ortiz isn't going to get a chance like this for a while, so let's hope the brain-trusts at Golden Boy can put together a pretty good fight.